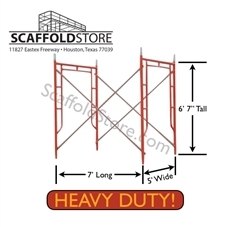 5' Wide x 6' 7" Tall x 7' Long Walk-Thru Scaffold Frame Set (Waco-Style) Weight: 145lbs. (approx.) 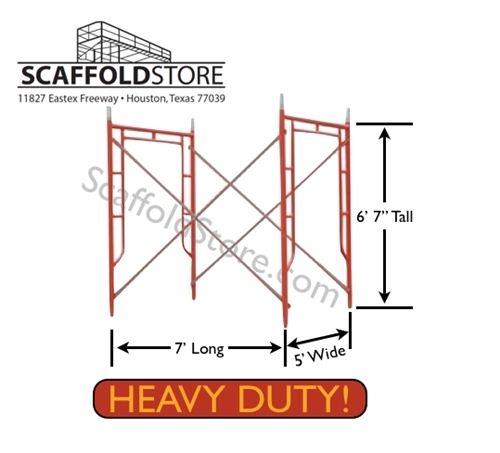 Scaffold Tube Size (Frame Leg): 1.625" OD (1-5/8") Includes: 2 - 5'W x 6' 7"T Heavy Duty Walk-Thru Scaffold Frames 2 - 7' x 4' Tubular Cross Braces 4 - Coupling Pins (1-3/8") 4 - Spring Clips This Frame contains 2-Locks on each Leg. Lock Spacing is 4'.